2. 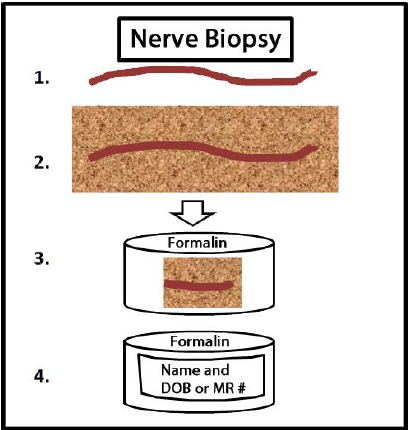 Instructions on how to correctly process nerve biopsy specimens are provided below. FOR SPECIMENTS DELIVERED TO UF HEALTH PATHOLOGY LABORATORIES ON SATURDAY: Ensure that a Saturday FedEx delivery label (enclosed in the provided specimen kit) is used and that the specimen is shipped on Friday. with the submitted biopsy sample. 1. Immediately upon receipt of the specimen, gently lay it flat on a cardboard strip. 2. Let the nerve rest for about one minute so it adheres to the cardboard. 3. Leave the nerve specimen attached to the cardboard. This is an important step for fixation. 4. Place the whole nerve specimen and cardboard into a formalin container. 5 .Ensure that the specimen is labeled with at least two unique patient identifiers – typically the patient’s name and date of birth or medical number. 7. Complete the attached Clinical Information Form for Nerve Biopsies.